AACEA and Len Riggs want to send out a special thank you to everyone who entered our Scholarship to Save Lives competition. We picked a winner: Will Franz who wrote this original composition. We're truly amazed to have such talented entrants! Thank you to everyone who participated, and remember, AACEA provides alcohol server training which promotes responsible service and sales of alcohol. AACEA is hosting a raffle for students enrolled in our alcohol server training classes – sign up today and you’re eligible to win $100 from AACEA and Len Riggs. To get your alcohol servers permit in Washington visit www.aacea.com. One of the best ways to become a successful bartender is to know your customers. Knowing your customers means using the customers names to build rapport, reading your customers, and anticipating their needs. Learn to remember names - if not long term, at least for the night. Pay close attention your customer when he walks in - and strike up conversation. The better you are at learning about and remembering your customers, the better you’ll be able to serve them. When it comes to using and remembering your customers names, you might cringe; however, nothing captures your customer’s attention and confidence faster than hearing his own name. You don't need a stellar memory - just find a way that works for you and stick to it. You might try name association; for example, Stella likes Stella Artois, Jerry likes Jack and Cokes. You could also try repetition; such as, "Hi, Dave!" and later, "Is your drink okay, Dave?" "Dave, can I get you anything else?" It sounds sort of silly, but it definitely works. There's no way to remember every customer's name, but try either of these tricks and you'll be amazed when - a month later - you remember the name of that familiar face at the bar! Learning a customer's name is a great way to get them talking, and talking with your customers clues you in to a few things. Are they chatty or reserved? A quick chat will put your customer at ease. Are they grumpy or do they seem happy? Alcohol seems to exaggerate moods, so you might be more cautious about how much you serve a sullen customer. Are they easy to talk to? You'll be better able to assess when enough is enough - for example, are they slurring? Has their reaction time dropped drastically? Pay attention to these clues and you'll know when to pour and when to say, "No more." Paying attention to these clues will also help you remember to check back in with your customers and anticipate their needs. You want bright, smiling faces around your bar and striking up conversation is a good way to engage your customers. Whether you bartend part-time or full-time, it is one of the most lucrative jobs in the hospitality industry. Even when the economy is not in great shape, many people will still go out drinking. As a bartender, you can make decent cash on the spot from tips, but the better bartender you are, the more cash you will make! To be a great bartender, you need to have a great personality. Smile, have a sense of humor, be outgoing, and enjoy your job. These are the things that really make a great bartender. 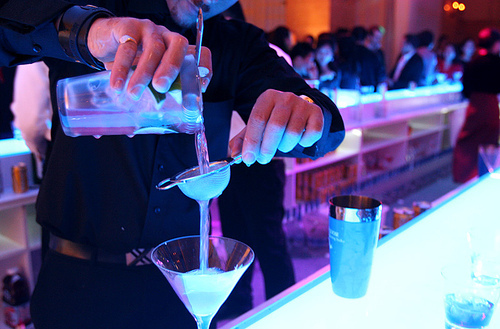 As a bartender, you have a responsibility to not over-serve your guests. Not only does it put your job and the community at risk, but a drunken guest does not equal better tips! BE ATTENTIVE. It is important that you are attentive. Be aware of when your guest is getting low on their drink. Don’t wait until they are finishing the last drop to ask if they want another. The key here is still not to over-serve! BE KNOWLEDGEABLE. It is important that you know how to make a good drink. Be aware of ingredients in a drink in case you have to substitute. Know all of your basic drinks and know your wines! Food pairing is important in any establishment and it is important to know which wine to offer with each item on the menu. BE ABLE TO MULTI-TASK. Remember that you are in customer service. Multi-tasking is key. Being able to take someone's drink order while giving change to someone else is efficient and saves you time. KNOW YOUR REGULARS. At the minimum, know people's first name. If a customer comes in and sits at the bar on a regular basis, you should learn his name, his drink, his job, and his spouse's name. Be attentive to his needs and take the time to talk to him or her. KNOW THE LAW! You play an important role in keeping your guests safe by selling alcohol responsibly and ensuring liquor laws are followed. It is crucial to check IDs carefully, watch for signs of intoxication and create an environment that discourages disorderly behavior. It is important to know the signs of intoxication - such as slurred speech, difficulty focusing, and aggressive behavior - when determining if a customer should be served alcohol. A list of signs can be found at here. If a customer is showing apparent signs, employees should not serve them and remove any alcohol they have in their possession. 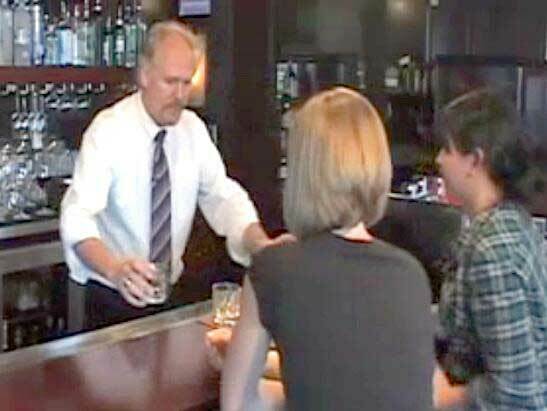 While the customer can remain at the restaurant as long as they are not acting disorderly, employees must make sure they don't get alcohol from someone else. Conduct violations Restaurants should intervene immediately if they see people arguing or acting aggressively in order to prevent a fight. Customers that fight may not remain at your business. When determining whether a disorderly conduct violation has occurred, the WSLCB looks at factors such as: * Did the restaurant create an environment that encouraged the behavior? * Did the restaurant allow the disorderly customer to remain at the business? * How did the restaurant respond to the altercation? * If there were injuries, were the police and medical aid called? Acceptable forms of ID * A drivers license, ID card, or instruction permit issued by any U.S. state or Canadian province * A Washington temporary drivers license (paper license) * A U.S. Military ID * An official passport * A merchant marine ID * A Washington State tribal enrollment card A valid ID must show: * Date of birth * Signature (except U.S. Military IDs) * Photo * Note: If an ID has an expiration date, the ID must not be expired How to check ID: * Ask for identification. * Have the customer hand you the ID. Do not accept or handle a customer's wallet. * Check the expiration date. Do not accept expired ID. * Check the date of birth. For vertical Washington IDs, check the information to the left of the photo to make sure the customer has turned 21. * Verify the photo matches the customer. * Verify the IDs unique features (for example, on a Washington ID, a black state seal overlaps the photo). AACEA Launches the First Washington State Approved Online Courseware for Alcohol Server Training.